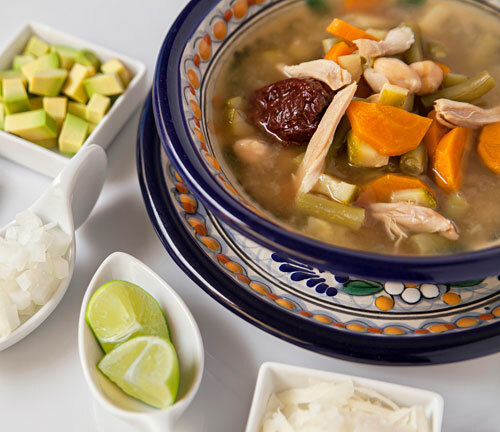 From Tlalpan... “The Tlalpeno Soup"
We really don’t know how to call this dish either a soup or a complete meal – since it has it all. A very similar concept to that of the pozole. In the Tlalpeno soup there is lots to be found and discover. What you are about to try is a chicken stock combined with onion, garlic and with the spicy and smoky touch of the chipotle pepper. Zucchinis, carrots and green beans are also added to the broth to give freshness and soften the flavors. As a final touch the broth also has chickpeas, which are mixed with shredded chicken to generate a rich source of protein . The history of the Tlalpeno soup tells that in Mexico in the early 1900’s the main mean of transportation of the city was the tram and one of the routes passed through the Tlalpan station, where food vendors were located. The food that was sold were mainly appetizers but there was a lady that sold hers chicken stock differently as it was known . She put chipotle pepper, avocado, cheese, vegetables and more ingredients. The most difficult part of making the Tlalpeno soup is to follow all the stages as there are many but they are not difficult to perform. In this recipe green beans are used and we recommend using raw or frozen green beans. Don’t use canned green beans because they don’t have so much flavor. If the Tlalpeno soup is prepared with canned chickpeas you will save many steps and time. It is very important to use skinless chicken breasts so a lot of fat doesn’t accumulate in the broth. Preparation time 8 hours (while the chickpeas are soaked) + 1 hour 35 minutes of soup preparation. The recipe serves 6 plates. If you are going to prepare this recipe with canned chickpeas, go to the stage of “Back to the Chickpeas" and add the chickpeas in the saucepan without pouring the liquid in which they are prepared. The enough Water to cover twice the height of the chickpeas. Leave the chickpeas soaking for about 8 hours, until they are soft. Verify that the chickpeas that were left soaking are soft, if not leave them soaking for a longer time. Transfer from the bowl to a colander the chickpeas that were soaked and remove the water excess. Transfer from the colander to a saucepan the chickpeas with the ones you worked. When it boils reduce to medium heat and leave the chickpeas cooking in the boiling water for approximately 1 hour, until they are well cooked. Cut 10.5 oz of green beans into small chunks, then reserve. Dice 2 zucchinis and reserve. Slice the carrots that were peeled; then set aside. Verify that the chickpeas that were left cooking are well cooked, they have to be soft; if not cook them for a longer time. The small chunks of the Green Beans that were cut. The dices of the Zucchinis that were cut. 2 Chipotle Peppers in Adobo. The enough Water to have the consistency of a watery soup. Bring the saucepan broth to a boil over high heat. When the broth boils reduce to low heat, cover the saucepan and leave it cooking for 25 minutes. Cut 3 limes into wedges, put them in a ramekin and reserve. Dice 5.2 oz of fresh cheese, put them in another ramekin and reserve. Finely chop 1/2 onion and put it in another ramekin. Take all the ramekins to the table, in which the ingredients were put. Dice 2 avocados, put them in a ramekin and take it to the table. The avocado is cut at the end because it oxidizes rapidly. Verify that the chicken that was left cooking is well cooked, its color must be white outside and inside; if not cook it for a longer time. Take from the saucepan the chicken breasts, with the kitchen spoon, wait until they cool a little and shred them. Incorporate in the saucepan the chicken that was shredded. Mix the Tlalpeno soup and cook it for 3 more minutes, so the flavors incorporate. Recommendation: The Tlalpeno soup can also be accompanied with corn tortillas. Variation: There are people that accustom to put white rice or red rice to the Tlalpeno soup. If you like the idea go ahead. Did you like the Tlalpeno Soup? You can put the garnishes that are placed on the table in these beautiful clay cazuelas. Your table will look divine and very Mexican. To make this recipe you have to chop a lot. Make it with a professional knife like the Victorinox, which will give you fast and precise cuts. The chickpeas are very important in the Tlalpeno soup and the Palouse Brand have the best quality and best flavor. Use them! 2019 mexican-authentic-recipes.com. All rights reserved.